The awesome television series Riverdale has many cool characters and groups. 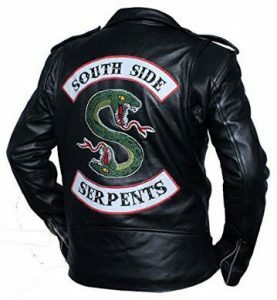 This is a great way to show off what side your on with the Southside Serpents Jughead Leather Jacket. The leather jacket is all black and features a large Southside Serpents logo on the back consisting of the green coiled snake with two heads. Made to be very durable from real leather giving you a very sharp look that will also last you a very long time. Features a full front zipper, zippered cuffs and a built in belt. And now there is a fake leather version too. Available in a wide selection of sizes that will range from XXSmall to 3XL so every fan can enjoy looking like a true Southside Serpents.